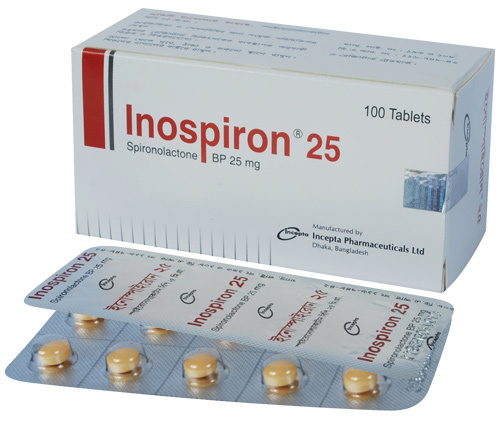 Inospiron 25: Each tablet contains Spironolactone BP 25 mg.
Inospiron is a preparation of long-acting aldosterone antagonist, potassium-sparing Spironolactone. Spironolactone is a specific pharmacologic antagonist of aldosterone, acting primarily through competitive binding of receptors at the aldosterone dependent sodium-potassium exchange site in the distal convoluted renal tubule. Inospiron® causes increased amounts of sodium and water to be excreted, while potassium and magnesium is retained. Edema in adults (congestive heart failure, hepatic cirrhosis, or nephrotic syndrome): An initial daily dosage of 100 mg of Inospiron® administered in either single or divided doses is recommended, but may range from 25 to 200 mg daily. Combined therapy with other diuretics is indicated when more rapid diuresis is desired. Primary hyperaldosteronism: After the diagnosis of hyperaldosteronism has been established, Inospiron® may be administered in doses of 100 to 400mg daily in preparation for surgery. For patients who are considered unsuitable for surgery, Inospiron® may be employed for long-term maintenance therapy at the lowest effective dosage determined for the individual patient. Essential hypertension: For adults, an initial daily dosage of 50 to 100 mg of Inospiron® administered in either single or divided doses is recommended. Hypokalemia: Inospiron® in a dosage ranging from 25 mg to 100 mg daily is useful in treating a diuretic-induced hypokalemia. Gynaecomastia may develop in association with the use of Spironolactone. Other adverse reactions are: GI symptoms including cramping and diarrhoea, drowsiness, lethargy, headache, urticaria, mental confusion, impotence, irregular menses or amenorrhoea and post-menopausal bleeding. All patients receiving diuretic therapy should be observed for evidence of fluid or electrolyte imbalance. Hyperkalemia may occur in patients with impaired renal function or excessive potassium intake and can cause cardiac irregularities, which may be fatal. Pregnancy: Spironolactone should not be used during pregnancy. Lactation: Canrenone, an active metabolite of Spironolactone, appears in breast milk. If use of the drug is deemed essential an alternative method of infant feeding should be instituted.